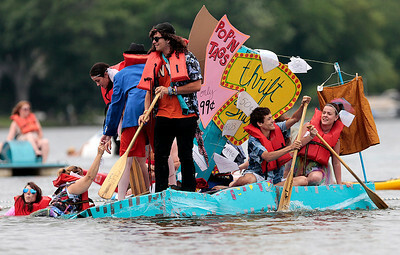 Kyle Grillot - kgrillot@shawmedia.com Participants compete on a boat named Thrift Shop during the 29th annual America’s Cardboard Cup Regatta at the Crystal Lake Park District’s Main Beach June 22, 2013. 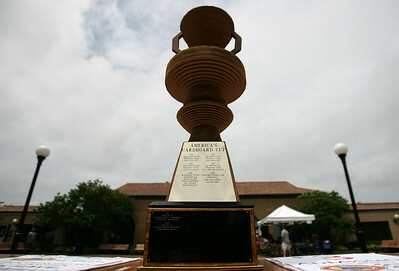 The competition raises money for local charities, contributing more than $500,000 since the first event. Entry fees are $20 per family and $200 per business with a $3 general admission fee per person that is capped at $15 per family. The event draws more than 2,000 people per year. Kyle Grillot - kgrillot@shawmedia.com David Low of Hoffman competes during the 29th annual America’s Cardboard Cup Regatta at the Crystal Lake Park District’s Main Beach June 22, 2013. 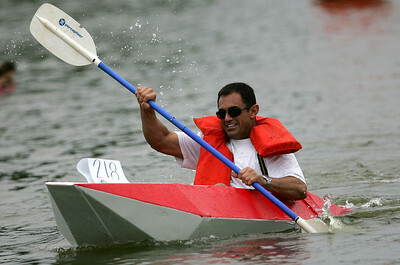 The competition raises money for local charities, contributing more than $500,000 since the first event. Entry fees are $20 per family and $200 per business with a $3 general admission fee per person that is capped at $15 per family. The event draws more than 2,000 people per year. Kyle Grillot - kgrillot@shawmedia.com Roan Low,11, of Hampshire digs himself out of the sand during the 29th annual America’s Cardboard Cup Regatta at the Crystal Lake Park District’s Main Beach June 22, 2013. The competition raises money for local charities, contributing more than $500,000 since the first event. Entry fees are $20 per family and $200 per business with a $3 general admission fee per person that is capped at $15 per family. The event draws more than 2,000 people per year. 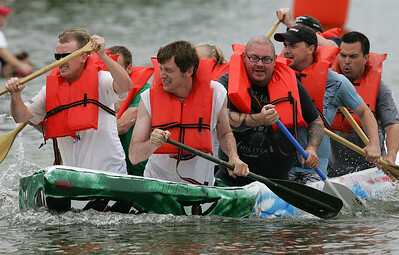 Kyle Grillot - kgrillot@shawmedia.com Participants compete during the 29th annual America’s Cardboard Cup Regatta at the Crystal Lake Park District’s Main Beach June 22, 2013. The competition raises money for local charities, contributing more than $500,000 since the first event. Entry fees are $20 per family and $200 per business with a $3 general admission fee per person that is capped at $15 per family. The event draws more than 2,000 people per year. 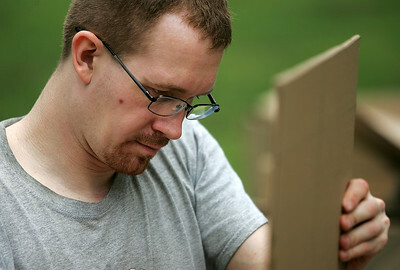 Kyle Grillot - kgrillot@shawmedia.com Wes Brazas of Hampshire constructs his boat for competition during the 29th annual America’s Cardboard Cup Regatta at the Crystal Lake Park District’s Main Beach June 22, 2013. The competition raises money for local charities, contributing more than $500,000 since the first event. Entry fees are $20 per family and $200 per business with a $3 general admission fee per person that is capped at $15 per family. The event draws more than 2,000 people per year. Kyle Grillot - kgrillot@shawmedia.com Chris Kachiroubas fires a blow horn to start a race during the 29th annual America’s Cardboard Cup Regatta at the Crystal Lake Park District’s Main Beach June 22, 2013. The competition raises money for local charities, contributing more than $500,000 since the first event. Entry fees are $20 per family and $200 per business with a $3 general admission fee per person that is capped at $15 per family. The event draws more than 2,000 people per year. 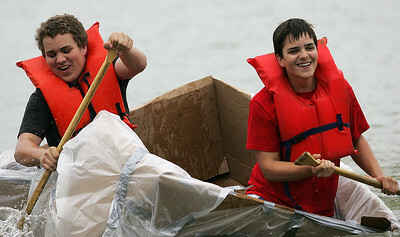 Kyle Grillot - kgrillot@shawmedia.com Sean Frank, 16, (left) and David Frank, 14, compete in a race during the 29th annual America’s Cardboard Cup Regatta at the Crystal Lake Park District’s Main Beach June 22, 2013. 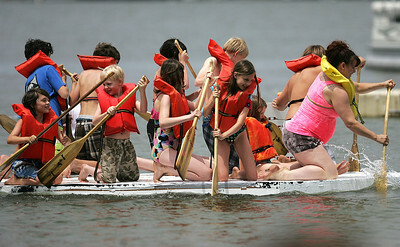 The competition raises money for local charities, contributing more than $500,000 since the first event. Entry fees are $20 per family and $200 per business with a $3 general admission fee per person that is capped at $15 per family. The event draws more than 2,000 people per year. Kyle Grillot - kgrillot@shawmedia.com The Cardboard cup is displayed on the entrance to the Crystal Lake Park District’s Main Beach during the 29th annual America’s Cardboard Cup Regatta June 22, 2013. The competition raises money for local charities, contributing more than $500,000 since the first event. Entry fees are $20 per family and $200 per business with a $3 general admission fee per person that is capped at $15 per family. The event draws more than 2,000 people per year. 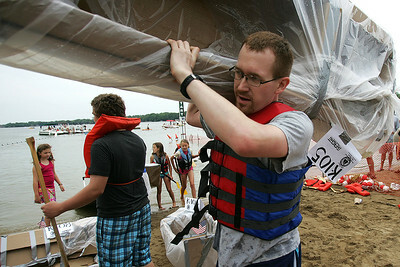 Kyle Grillot - kgrillot@shawmedia.com Wes Brazas of Hampshire carries his boat onto land after competing in the 29th annual America’s Cardboard Cup Regatta at the Crystal Lake Park District’s Main Beach June 22, 2013. The competition raises money for local charities, contributing more than $500,000 since the first event. Entry fees are $20 per family and $200 per business with a $3 general admission fee per person that is capped at $15 per family. The event draws more than 2,000 people per year. 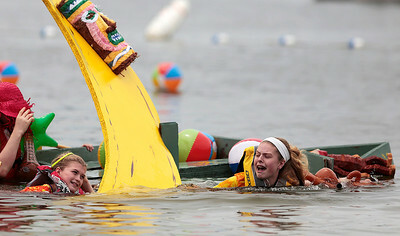 Kyle Grillot - kgrillot@shawmedia.com Kate Smeenge, 11, (left) and Kelsey Smith, 11, both of Crystal Lake pull their boat "Go Bananas" to shore after capsizing during the 29th annual America’s Cardboard Cup Regatta at the Crystal Lake Park District’s Main Beach June 22, 2013. The competition raises money for local charities, contributing more than $500,000 since the first event. Entry fees are $20 per family and $200 per business with a $3 general admission fee per person that is capped at $15 per family. The event draws more than 2,000 people per year. 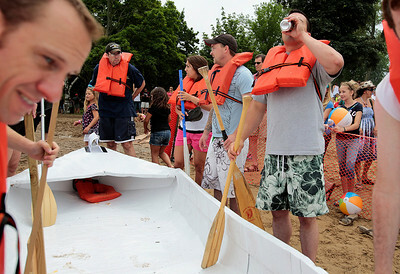 Kyle Grillot - kgrillot@shawmedia.com Participants prepare to place a boat in the water before the start of a race during the 29th annual America’s Cardboard Cup Regatta at the Crystal Lake Park District’s Main Beach June 22, 2013. The competition raises money for local charities, contributing more than $500,000 since the first event. Entry fees are $20 per family and $200 per business with a $3 general admission fee per person that is capped at $15 per family. The event draws more than 2,000 people per year.